The ever-stunning Serafino Wines have released a new menu celebrating the colours and flavours of autumn. Located in the remarkable Fleurieu Peninsula, Serafino is at the centre of a relaxed and beautiful scenery; even in the drier autumn season the place is lush and inviting. The kitchen staff at Serafino Wines, under the guidance of Head Chef, Daniel Armon, have created the perfect autumn dining experience that any guest will love. Featuring ingredients sourced fresh and locally, Serafino Wines take pride in serving only the best quality produce to their customers; even having their own in-house garden to grow all of their vegetables and herbs. 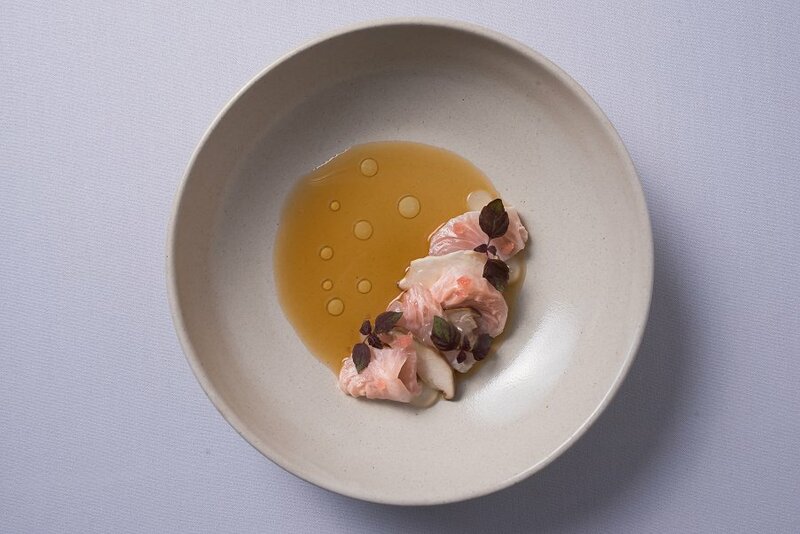 The Hiramasa Kingfish Crudo is served with king oyster ceviche, native lime, miso consommé, kelp oil and shiso. The Port Lincoln fish was cured in three types of native lime; finger lime, blood lime and desert lime, that gave a lovely sour tang. The Kingfish was beautifully fresh and full of flavour; the lightness pairing well with the earthy notes from the mushrooms. The sour notes from the cured limes, balanced well with the sweet and earthy shiso herbs that popped on the tongue; another lovely flavour balance to the kingfish. Tangy, fresh and light; this beautiful dish (both in flavour and looks) was the perfect start to our tasting. 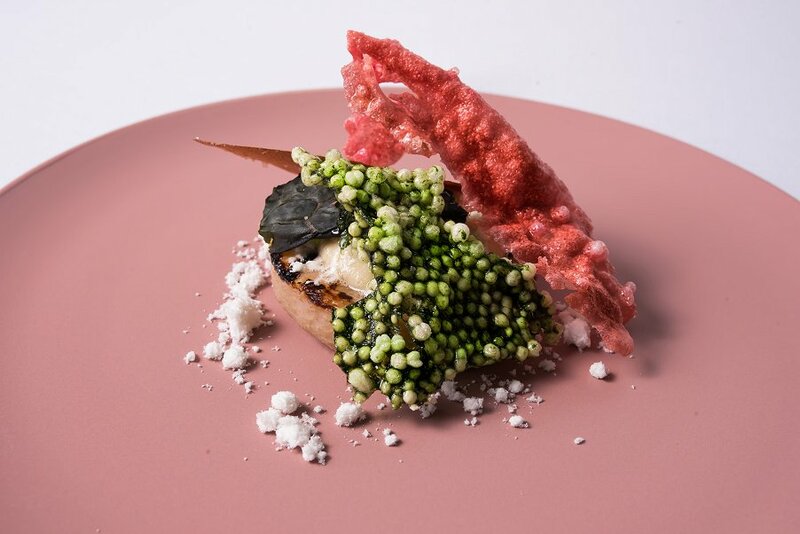 Autumn on a Plate was made with kohlrabi, horseradish snow, Jerusalem artichoke cream, spinach, beetroot and cavollo nero chips. Sous Vide for two hours and then chargrilled, the kohlrabi was full of flavour. The various vegetable crisps, gave earthy and sweet flavours, adding a lovely texture balance to the soft kohlrabi. The Jerusalem artichoke cream was soft and light, with balancing flavours to the crisps, all holding various earthy tones. A beautiful warming dish that perfectly represented the flavours and feeling of autumn. 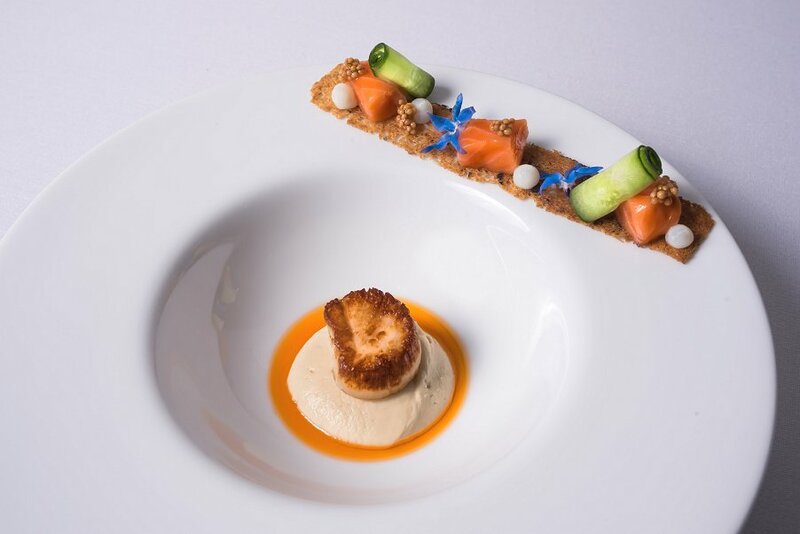 The Scallop and Ora King Salmon was served with a sourdough crisp, cucumber, pickled mustard, buttermilk, cauliflower truffle and house-made lobster oil. 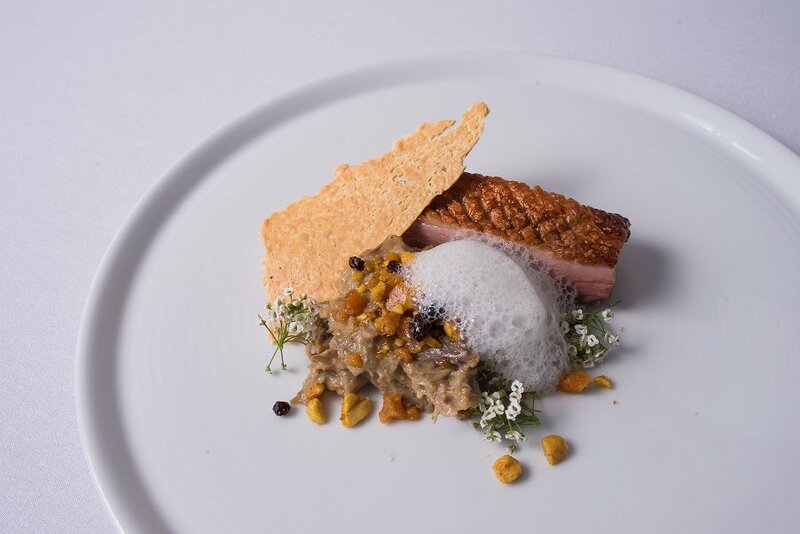 The King Salmon, sourced from New Zealand, was cured then confited with a house-made buttermilk gel. The meatier scallop was pan seared and had a lovely melt-in-your-mouth texture; paired with fresh cool salmon. The grain mustard gave off a sharp tang, which balanced with the fresh and light cucumber. The dish held lovely and rich sea flavours that balanced well with the crunchy sourdough crisp that presented earthier and nuttier flavours. The smooth cauliflower truffle cream also held deep rich earthy tones that tied the different components together. Onkaparinga Venison was served with a celeriac pure, heirloom beetroot, blackberry, jus, chocolate and red vein sorrel. The celeriac and beetroot were deliciously fresh, taken straight from the in-kitchen garden. 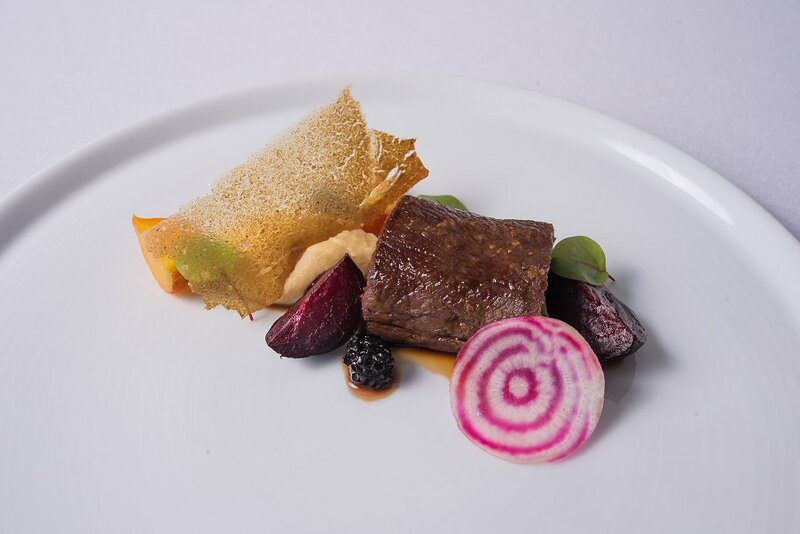 The three types of beetroot: Yellow Beetroot, Baby Purple Beetroot and Candy striped Beetroot, (also grown in the kitchen garden), gave off earthy and sweet flavours that paired perfectly with the locally sourced venison. The meat was perfectly cooked, soft and tender, that held a gamey flavour and hints of smoky tones. The earthy creamy pure balanced with the crunch of the different beetroots, while the blackberries gave a sweet burst that complimented the other components and added to the deeper meaty flavours. 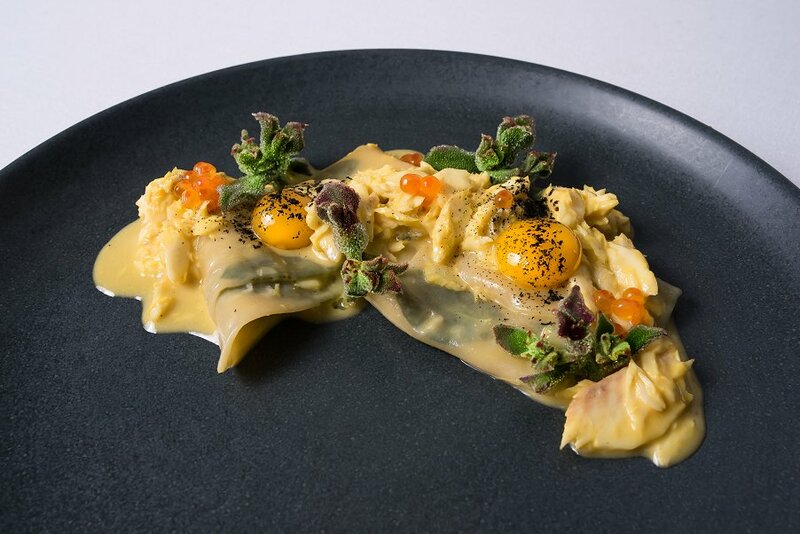 The Garden Leaf Maltagliati pasta was made with King George whiting nage, smoked salmon roe, confit quail egg, lemon aspen oil and garnished with fresh ice plant. The rough-cut pasta was cooked well and tasted fresh and smooth. It was made with fresh herbs pressed in-between the pasta sheets, which enhanced the flavours. The King George whiting was cooked to perfection, tender and full of flavour that balanced with the sourness of the ice plant and the lovely salty pop from the salmon roe. The smooth and creamy quail eggs were deliciously runny, adding lovely rich sweeter tones to the pasta and balancing the slight tang of the lemon aspen oil. Overall this entrée was full of flavour and held a lovely golden colour that resembled the warm sun and the golden leaves of autumn. The Lenswood Duck main was similar to a deconstructed curry. Inspired by Indian and Thai dishes, this meal used both duck breasts cured in in Indian curry spices, and a Thai curry inspired duck leg. It also included yoghurt textures, madras granola and chamomile soaked raisins. The duck was superb, and I can honestly say one of the best duck dishes I have ever had. The leg and breast was cooked perfectly, soft and tender that just melted in your mouth. Lovely salty flavours held on the breast skin that paired perfectly with the multiple curry spices. The spices held a slight heat but were cooled from the smooth yoghurt foam and the light and crunchy yoghurt crisp. These creamy flavours balanced well with the sweeter pop of the raisins that also helped to balance the spices. This duck dish was fragrant and packed full of flavour, while the heat from the spices warmed the mouth, perfect for the cold autumn days going into winter. 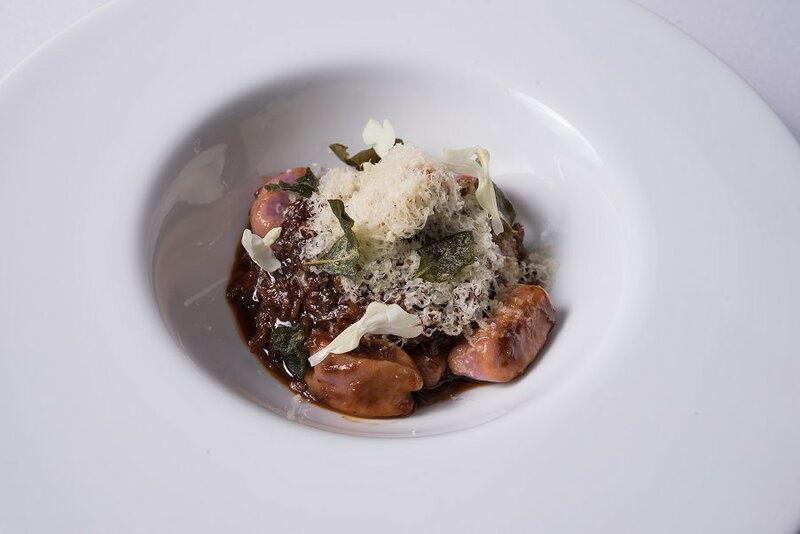 The Paroo Kangaroo and Gnocchi was created with braised kangaroo tail, beetroot gnocchi, juniper, saltbush and shaved Pyengana cheddar to top. The braised tail was beautifully soft and tender and held deep and rich meaty tones. The kangaroo meat was a lovely pairing to the soft and warm beetroot gnocchi. Cooked well, the gnocchi held a slight sweetness from its beetroot base that balanced with the fuller red wine jus that marinated the kangaroo meat. The shaved cheddar on top lifted the deep and rich flavours and tied each component together. 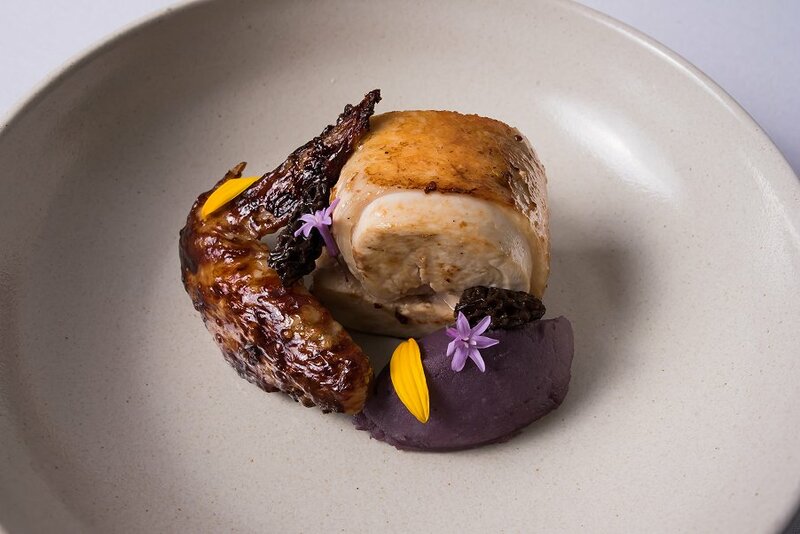 Nomad Farm Chicken is made with galantine, a glazed wing, congo potato, morels, rhubarb, mountain pepper consommé and anise hyssop. The chicken, sourced from Currency Creek, was cooked well. By pan searing the chicken, it brought out lovely strong flavours in the meat that paired perfectly with the herb-coated skin, which was soft and full of flavour. The chicken wing was glazed in a sticky sauce that added a sweeter balance to the heavier, earthy flavours of the meat. The wing also gave a texture balance with a slight crispy skin. The purple congo potato mash was soft, creamy and smooth, while the anise hyssop herb added a slight tang to the dish. The Market Fish dish changes depending on what special fish is freshest each week. 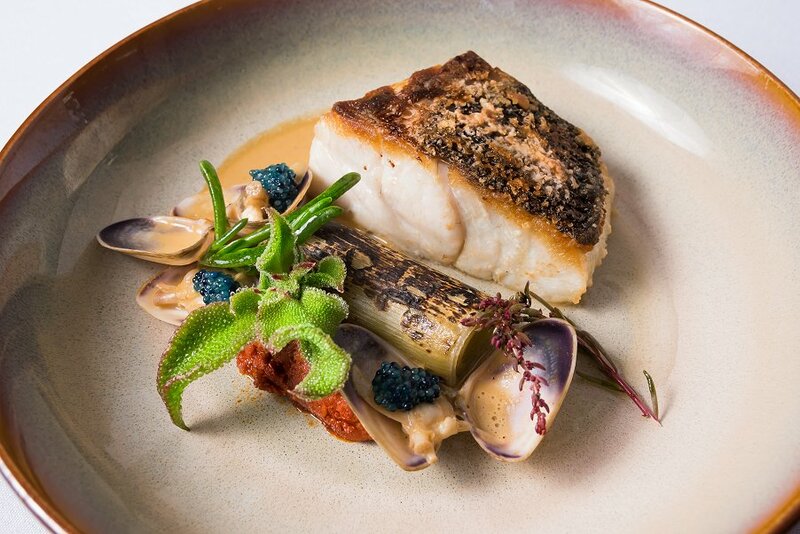 We were served a delicious Blue Eye Trevalla with Goolwa pipis, nduja, burnt leek, mussel cream, scampi roe and succulents. The scampi roe was fresh and paired nicely with the soft Blue Eye Trevalla that was cooked perfectly and pulled apart without needing a knife. The fresh pipis and the blue scampi roe added to the rich sea flavour, while the mussel cream and leek stalks balanced the flavours with slightly smoky notes. The nduja added a lot of spice to the dish, giving a nice kick to lift the flavours. Serafino’s Steak was locally sourced from Kangarilla. 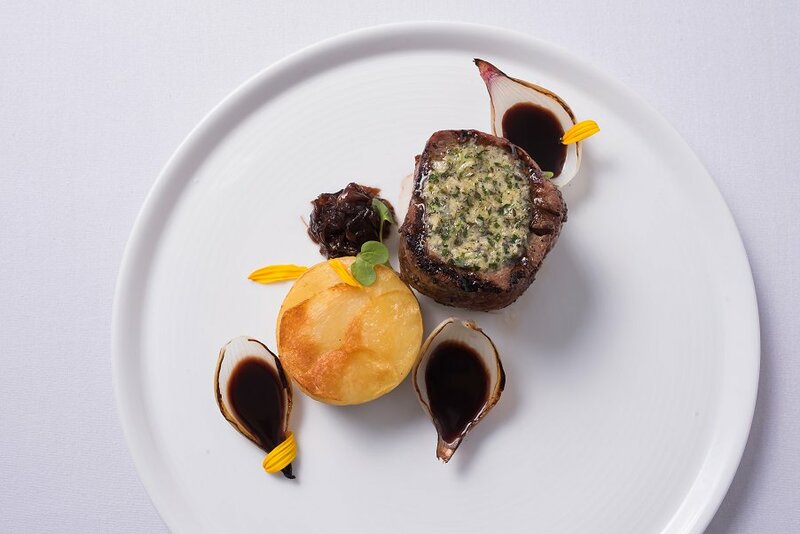 The delicious beef fillet was served with a duck fat potato gratin, shark tooth jus, onion jam and horseradish and garden herb butter. The soft, thinly sliced potato, was full of flavour from being cooked in duck fat and various herbs such as sage and rosemary, and held a lovely crispy skin. The steak was cooked perfectly, medium-rare, and was soft and tender; I was even able to cut it with a regular butter knife. Sweeter notes came from the roasted onion pieces and the lovely rich onion jam that paired perfectly with the earthy meat flavour. The tang from the horseradish and garden herb butter complimented all the existing flavours, and lightened the deep meaty tones. For dessert we tasted the Apple Tart. 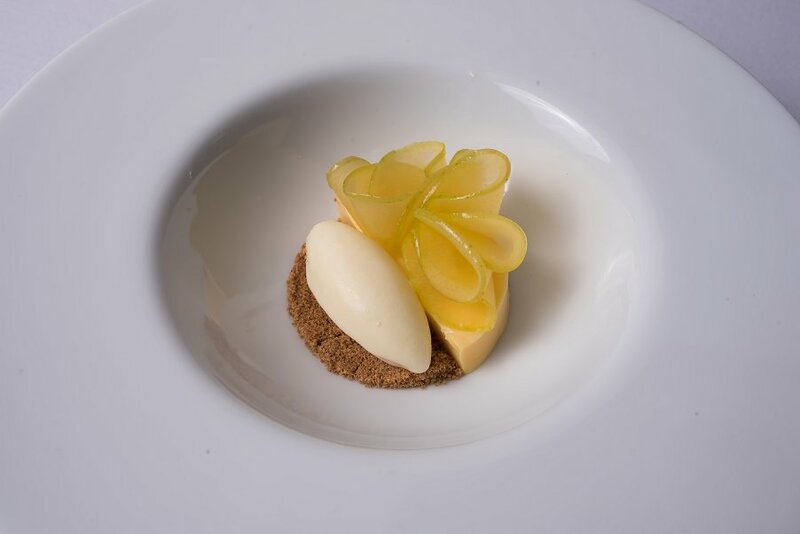 This elegant take on an apple pie, was made with a cinnamon pastry, pressed apple, anglaise and mascarpone sorbet. The deconstructed apple tart was deliciously fresh and light. The cinnamon crumb paired perfectly with the set anglaise and the pressed granny smith apples. The mascarpone sorbet had a lovely milky and slightly sweet flavour that added another refreshing element to the dish. The smooth anglaise was almost like custard, that balanced the textures of the crisp as well as the sweet apples that were soaked in a ginger sugar syrup. The ginger wasn’t too strong, just gave a lovely earthy and savoury tang that balanced out the sweeter elements. Lovely and light, the apple tart was a delicious and cooling dessert. Autumn Fruits was made with compressed pineapple slices, a pineapple sorbet, house-made yoghurt, a Crunchy Nut crisp, blackberry syrup and a house-made aged sour tepache. The compressed pineapple slices with the sweet blackberry sugar syrup and plum compote made for a refreshing and light dish. There was a lovely balance of sweet and earthy tones with the nuttiness from the crisp and creamy yoghurt that was not overly sweet, so balanced well with the natural sweetness from the pineapple and the sorbet. 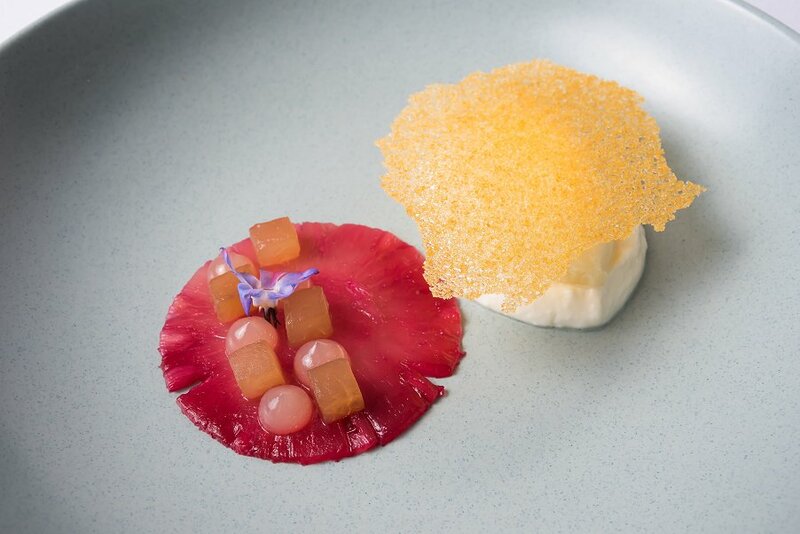 The house-made aged pineapple tepache, or vinegar, gave a slight sour tang to the dish and was the perfect component to tie the different flavours together. This dish was refreshing and not too filling; perfect to have after a large heavy meal. The Applewood Smoked Chocolate mousse was served with fig leaf ice cream, apple foam and cocoa nib glass. Presented in a wine box, the smoke was trapped inside, making for a lovely display when we opened the lid at our table. 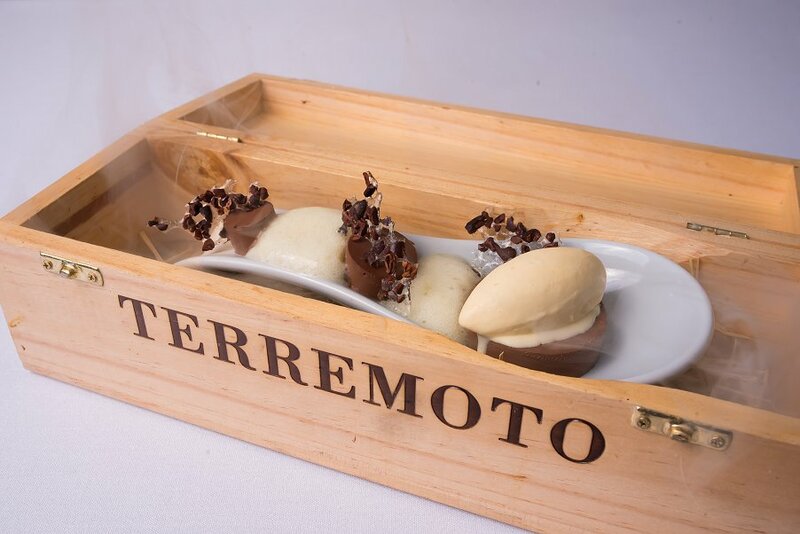 Rich smoky flavours dominated the dish, complimenting the deep chocolate flavours of the smooth and creamy mousse. The cocoa nib was stronger in flavour, rich and dark that gave a slight bitter tang that balanced with the apple foam. The apple was a lovely flavour that helped lift the heavier smoky chocolate flavours. The fig leaf ice cream was creamy and smooth and helped to balance the dish’s strong smoky tones with a sweeter flavour. We could not fault any dish on Serafino’s new Autumn Menu. Both presentation and flavour was exceptional, and it was evident that Head Chef, Daniel Armon, and his team took great pride and care creating every dish into an autumn experience for their guests. With the beautiful use of seasonal ingredients, it was a pleasure to immerse ourselves into the new season, and we can’t wait to see what Daniel and his team have in store for winter.